We have been podcasting and boy do we love it. It’s something that we should have done many years ago, but neither of us really had the confidence to just get up their and ramble on which is something you kind of need the ability to do if you want to create a podcast. Having said that however, I can personally tell you now that you don’t have to have the confidence at the start. We definitely didn’t and if you listen to our very first podcast you will see how scripted it was. We had no idea what we were going to say and the script was the only way we were going to get through that first podcast. By about the third or fourth podcast, we were flying though them and today, we don’t even create notes for our podcasts. We decide that we are going to create one and a few minutes before we start recording we go through what we might want to talk about and away we go. So what I am trying to say here is don’t be deterred if you think you don’t have what it takes to record a podcast because all it takes is practice. You’ve just got to get in there and do it. 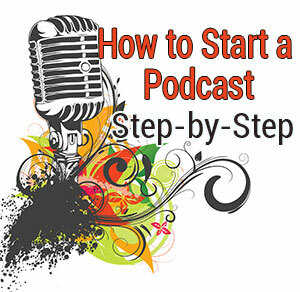 So since we enjoy podcasting and we can see the benefit of it we are starting a podcast here for this blog, so we thought we would take you through the steps we go through to create a podcast channel and get the first podcast recorded and published. If you have a website then one of the best things you can do is to start a podcast. Of course, it will depend on your website topic as to whether it lends itself to a podcast but just about all topics can work. So what are the benefits of podcasting? The biggest benefit is an increase in traffic to your website. There is a whole world of people on iTunes, Stitcher and other podcasting directories who don’t know about you and your website. Just think about it for a minute. Let’s say you have a website on dogs. Nice choice with plenty of potential but how many other people have a website on dogs? You only have to do a quick search in Google to know that there are millions of websites already doing the same thing. The competition is horrendous. Now let’s take a look at all of the podcasts related to dogs. I can almost guarantee that you won’t find millions of podcasts on dogs. Maybe a few hundred, maybe even a thousand, could be more, but millions??…nope. So your competition is so much less, which means you can be found so much easier. And if you choose a topic that is less competitive than the dog niche then you might even find that no one is even doing a podcast related to your niche. So you can draw on that untapped market of people wanting to hear what you have to say about their favourite topic. And while you are doing that you can encourage them to visit your website. You can also make money directly from your podcast by promoting your own or other people’s products. Or you can sell an app for your podcast, sell subscriptions to premium podcast episodes or include paid advertising spots in your podcast. So starting a podcast can be of great benefit to your online business. You are obviously going to be recording your podcasts so you need something to record them with. If you are just starting out and have limited funds you can always record using your phone. As long as it can save the recording as an MP3 it will do the job, although sound quality probably may not be that great and sound is important when it comes to podcasting. If you want to invest in a microphone that has good sound at a bargain price, then we recommend the Blue Yeti. It’s what we use for most of our podcasts. It plugs straight into the usb on your computer (PC or Mac) and takes minimal setup to get it going. We love it. You are going to need some sort of software to edit the podcast recording before you publish it. We use LogicPro to edit our podcast recordings but if you want something free than you can’t go past Audacity. This is awesome software that works for both a Mac or Windows computer and is relatively easy to use. We’ll show you how to use it further below. You will need somewhere to upload your podcasts to. There are a few options you can go with. Upload them to your website – Not recommend because if your podcast becomes popular, it can use up a lot of bandwidth which could potentially cause your site to crash. Upload them to Amazon S3 – Amazon has a storage area that you can load unlimited files to for free. Unfortunately each time someone downloads and listens to your podcast, Amazon charges you for it. The price is minimal until you start getting a lot of downloads which is what happened to us. We had to move our podcasts to another service as Amazon didn’t turn out to be very cost effective in the end. Amazon S3 can also be quite complicated to set up so not really recommended. Upload them to a dedicated podcasting hosting company. This is our preferred option. The two biggest companies that provide this service are Blubrry and Libsyn. The price is quite low per month for either option and that is your only cost. You don’t have to pay for downloads like you would with Amazon S3, just a set monthly fee. We debated about which one to go with but ended up going with Libsyn but from what we have read Blubrry is just as good so I think you would be happy with either choice. We’ll show you how to use Libysyn in more detail below. The steps in this tutorial assume that you have a WordPress blog. The final thing you will need to get your podcast up and running is a free WordPress plugin called PowerPress. It was developed by Blubrry but it doesn’t matter whether you use Blubrry or Libsyn as this plugin will work for both. This plugin basically gets your podcast up on to your site and provides iTunes with a means of finding your podcast. This can be the hardest step for many as there can be quite a lot of fear associated with public speaking. I understand this completely as in my younger days, I dreaded public speaking. All you need to remember is that none of your podcasts will be live and nobody is going to hear anything until you publish it. So you can record as much as you like to get a bit of practice in before you finally decide to upload your first podcast. However, you have to get something up eventually so even if it isn’t that great, just accept it and publish it. You have to start somewhere, so go with it. You will get better…believe me! The actual recording part is quite easy if you are using a microphone like the Yeti and some free software called Audacity. We’ll show you how in the video below. And if you are lucky, you will have recorded your podcast perfectly and it won’t require any editing. However, oftentimes you may have to edit out bits and pieces of unwanted noise…the neighbours dog barking, the plane flying overhead, an unintentional cough or sneeze or just some tummy rumbling sounds. Preferably, you should also add an intro of some sort to play at the beginning of every podcast. We purchased a short music audio clip on iStock and added a voiceover to ours. In this video, we show you how to record and edit using a Yeti microphone with Audacity. The next step is to upload your podcast using your chosen podcast hosting option. We use Libsyn so we will be showing you how to upload your podcast to Libsyn in the next video below. In order for iTunes and other podcasting directories to find your podcast you need to use a plugin called Powerpress. This plugin is free and makes it super easy to get your podcast out there. In this video, we show you how to install and set up PowerPress for your podcast. The final step is to submit your podcast to iTunes. We’ll show you how in the video below. You will need an Apple ID in order to do this but if you already have an iPhone, iPad, Mac or any Apple product you will most likely already have an account so you can use that one. And you can download the iTunes software here if you don’t already have it. You can also submit your podcast to Stitcher here. Okay, you are done. Now when you record your next podcast, you simply need to record it, upload to Libsyn (or Blubrry), create a blog post and add the podcast URL to that post. If my blog is about retirees/senior citizens, can I do product reviews (ex. liquid chalk markers) totally unrelated to my Journey Blog? Personally I wouldn’t do that and why would you anyway when there are loads of products you could promote. Think about what retirees do…they might garden, they might travel, they might take up a hobby, they might even want to start up their own website. In each of those categories are thousands of products that you could promote that are related to your blog. Can I pull more visitors to my blog and youtube channel with constant podcast? Yes definitely. That’s the beauty of creating a podcast. You can get a whole new audience coming to your blog.